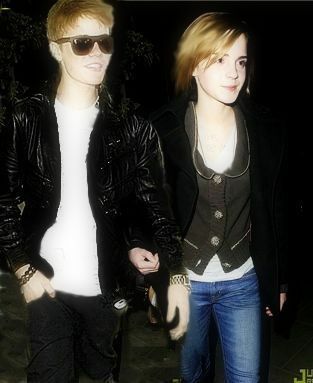 justin bieber and emma watson. couple,Give 评论 about this image. Wallpaper and background images in the 贾斯汀·比伯 club tagged: justin bieber justin bieber bieber fever dr bieber down to earth never say never 2011 singer. This 贾斯汀·比伯 photo contains 精心打扮的人, 西装, 裤套装, 裤装, 穿着好衣服的人, 裤子套装, 穿得好的人, and 套装. There might also be 太阳镜, 墨镜, 色调, 深色眼镜, 盒子外套, 盒外套, 框的外套, hip boot, and thigh boot.